Most songbirds head south for the winter, as food supplies disappear, returning to breed in the spring, when booming insect populations can satisfy clamoring broods. Not crossbills. 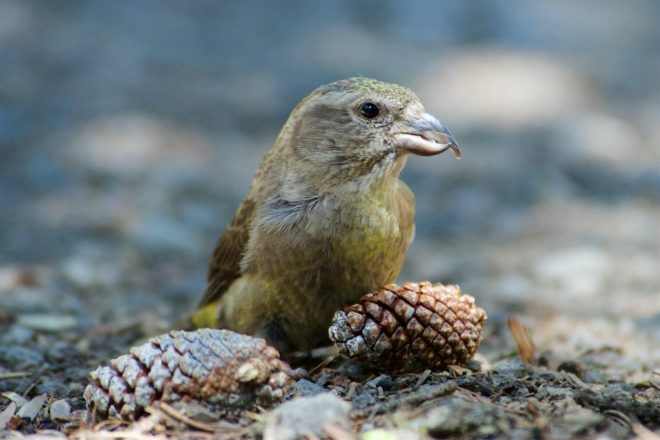 This colorful finch, which inhabits coniferous forests around the world, breeds most anytime thanks to a highly specialized beak that can extract seeds from pinecones throughout the year. But, for a newly discovered crossbill species, this custom-made tool may prove useless if climate change claims its favorite food. Crossbills, as their name suggests, have beaks that cross at the tips, creating a sort of avian crowbar that the birds use to pry open cones and slurp up seeds. 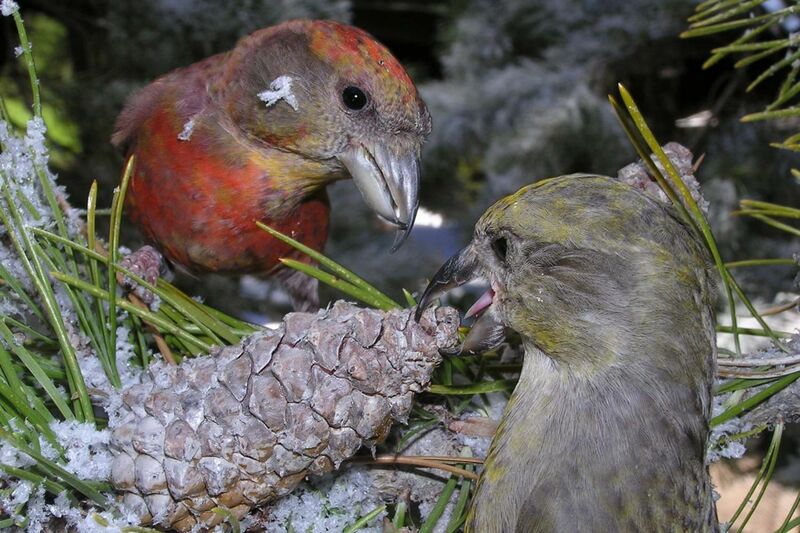 Crossbill beaks come in a variety of sizes, each tailored to a different conifer species. The birds typically roam from forest to forest, guided by a unique call that keeps those with similar beaks flocking together, until they find a bumper crop of their preferred cones. These nomadic foragers have been spotted nesting every month of the year, says Craig Benkman, a University of Wyoming evolutionary ecologist who’s studied crossbills for 35 years. He once saw crossbills in Canada feeding their babies in February when it was minus 40 degrees. Then, about two decades ago in southern Idaho, he discovered what appeared to be red crossbills nesting like regular songbirds. “They nest twice and that’s it,” he says, mostly in late spring and early summer. He was convinced he’d found a new species. But it took him more than 20 years to prove it. The birds could settle down because the lodgepole pine cones they specialize on retain their seeds indefinitely until the heat of forest fires melts the resin that seals the scales shut. And that’s because squirrels — crossbills’ main competition for seeds in most places — never ventured into the isolated forests of Cassia County’s South Hills and Albion Mountains. If they had, more pines would have likely shed their seeds regularly to defend against a rodent that routinely steals all of a tree’s cones for its winter pantry. Benkman first encountered these new crossbills while collecting pine cones to see how they evolved without squirrels. He’d assumed that only squirrels could trigger evolutionary defenses in the cones while birds were “just ornaments on a tree.” But the cones surprised him. Their scales were larger and thicker than he’d expected. He figured the birds must have bigger beaks to pry them apart — which is exactly what he found. And the bills don’t simply fit the cones, he later showed, but shape their structure. As crossbills exploited cracks in weathered cones, lodgepole pines evolved increasingly larger, thicker scales — and the birds, in turn, evolved stouter and stouter beaks. And as their beaks evolved, their calls followed suit. In just 20 years, Benkman recently discovered, their calls diverged dramatically from those of red crossbills passing through. Amazingly, even individual birds change their tune over their lifetime. “We don’t know of anything quite like this,” Benkman says. That rapidly diverging call likely kept resident crossbills from mating with their wandering counterparts. Benkman’s team showed in field and lab experiments that crossbills preferred the company of birds that sang the same song. Residents rarely mated with ramblers — and their genome proves it. “The Cassia crossbill is the most distinctive crossbill in the New World,” Benkman says. Finally, last year, the American Ornithological Society agreed with Benkman and recognized the Cassia crossbill as a new species. But for Benkman the victory was bittersweet: In August he and his colleagues reported that the Cassia’s days may be numbered. Climate models predict that the South Hills and Albion Mountains will see more hot summer days, which is bad news for this highly specialized forager. In several summers with just four days over 90 degrees, lodgepole cones shed their seeds, Benkman found, leading to an 80 percent decline in Cassias between 2003 and 2011. The population rebounded following several summers without heat waves but Benkman thinks only about 5,800 birds remain. Even worse, the models predict that lodgepole pines will vanish from these forests by 2080, victims of rising temperatures and more frequent and severe fires. No lodgepole pines means no Cassia crossbills. The species might stand a chance if forest managers are willing to take steps to reduce the severity of fires and can identify and plant trees with cones that stay closed at higher temperatures. But it’s not clear whether such efforts are even feasible or worthwhile, Benkman says. He’s holding out hope that we “come to our senses” and get serious about reversing climate change.